TYTAN Window & Door Pro is AAMA approved and uses an innovative no-bow technology to create a water and airtight seal. It saves you money by providing superior yield so you can install more windows and doors. It offers superior R-value which reduces energy consumption and contributes to LEED’s energy-saving standards. It has premium adhesion abilities to most construction materials including wood, metal, masonry, glass, and most plastics so your windows and doors will stay sealed during construction and climate changes. With TYTAN Window & Door Pro Insulating Foam Sealant you can build with confidence. 18 month shelf life form date of production. TYTAN Fill All insulating foam sealant is made with Smart Foam technology. Smart Foam Technology makes products more versatile while offering superior yield, adhesion, R-value, and sealing properties. 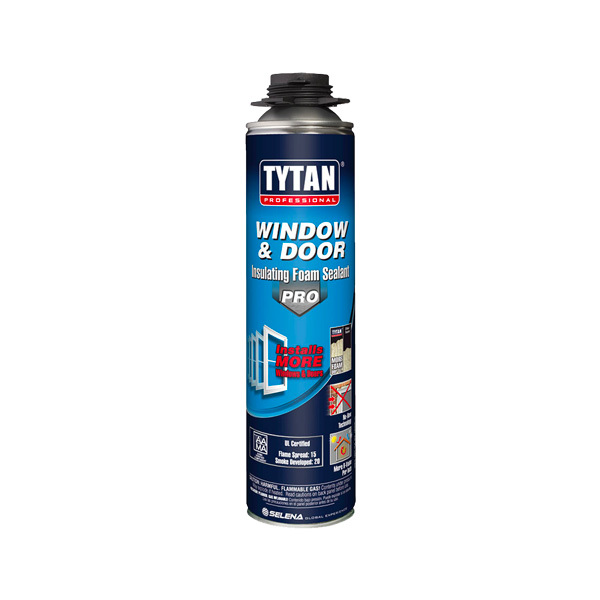 All TYTAN foam sealants are safe for use around windows & doors, as they expand toward the area of least resistance. With Fill All, you no longer need to buy multiple foams depending on the size of the gap you’re filling. Fills all gaps between 1/4"-3"
The top load, all-steel guns are durable and perform like more expensive models. The Ultra Gun will give you increased output with a bigger bead. They are Teflon coated for easier cleaning.